Welcome to the world of virtual food. You know what they say: When life gives you lemons, carefully put them away in the fridge for later, then let some scientists in Singapore use electrodes and LED lights to remotely trick your taste buds into thinking you're drinking lemonade. Okay, maybe not. But maybe it's only a matter of time before the saying really does change, because "sending tastes" over the Internet is really something you might be able to do soon. Researchers at the University of Singapore presented their work on the matter at the Conference on Tangible, Embedded and Embodied Interaction in Yokohama, Japan this month. Using just electrodes and sensors, they were able to convince tasters that they were drinking lemonade when, in fact, they were not. 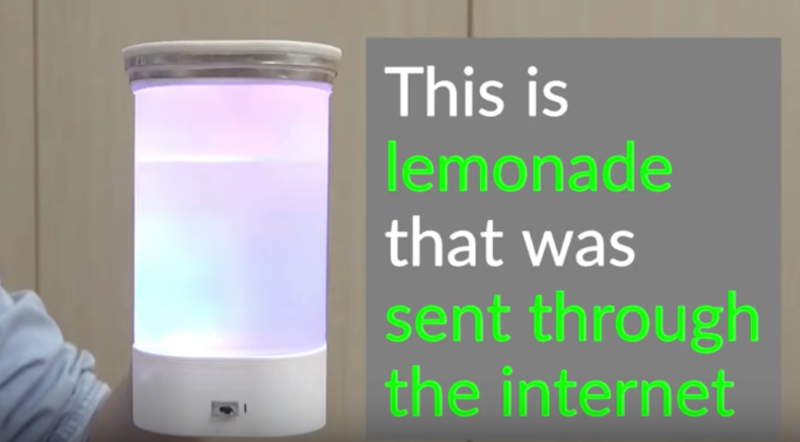 The results of the experiment also mean they'd be able to transmit that lemonade taste over the Internet to virtually "send" people glasses of lemonade. In their experiment, 13 tasters were given glasses filled with cloudy white, green, or yellow liquids, some of which were colored using LED lights. Then, their taste buds were stimulated using electricity. They were told to put the tips of their tongues on the rim of the glass before taking their first sip, and then they were asked to describe what they thought of the beverage. Several of the participants believed that the water they were drinking was sour, like lemonade. Since some of the glasses did, in fact, contain lemonade, that makes sense, but the cloudy white drink was also rated as "lemonade-like." But as cool as that is all by itself, it's the far-reaching implications of the study that have been most exciting to researchers (and to us). Nimesha Ranasinghe, one of the scientists working on the experiment, made a particularly captivating point when he told New Scientist that perhaps the experiment meant that taste could be shared on the Internet. "People are always posting pictures of drinks on social media — what if you could upload the taste as well? That's the ultimate goal." Smell is one important sense that hasn't yet been figured out as it relates to this experiment, but it's one of a handful of items scientists are currently researching. "We're working on a full virtual cocktail with smell, taste, and color all covered," said Ranasinghe. "We want to be able to create any drink." Virtual eating might just sound like good fun, but just think what this could mean for people with allergies or restrictive medical conditions. There are a ton of important, real-world applications for this, and we can't wait to see how the research continues to pan out.